The limb of the mater is soldered to the back plate and has a scale of degrees 0 to 360, divided to 5, subdivided to 1, numbered by 10. The rim is numbered for equal hours, 1 to 12 twice. The throne is in the form of a fleur-de-lis supported by a lion cast in brass on either side. The inside of the mater has circles for the equator and tropic of cancer. The rete has 24 named stars, most of the pointers springing from open-work bases, but 6 taking the form of birds with long beaks. A semi-quatrefoil is at the southern and a Moorish arch at the northern end of the meridian line. The east-west bar is counterchanged three times on either side of the pole. Two ties link the ecliptic band to the tropic of capricorn, and one links it to the equator. The ecliptic is divided into the named zodiacal signs, each one with a scale of 30 degrees, divided to 5 degrees, subdivided to 1, numbered by 5. Seven latitude plates engraved for latitudes 22 and 31? ; 35 and 38? ; 39 and 43? ; 40 and 41? ; 44 and 48? ; 50 and 51?. A typical plate has almucantars for every 2 degrees, every third line indicated by dots, numbered by 3, unequal hour lines numbered 1 to 12, dawn and dusk lines with dots, meridian and east-west lines, and circles for the tropics and equator. The latitude is indicated (e.g. 'LATI 22'). There are no azimuth lines. The plate for 50 degrees lacks almucantars and numbers on the hour lines and the word 'LATI'; on the reverse is an inconsistent plate with no numbers or stated latitude. The plate for 51 degrees has no numbers on the almucantars, no added dots, no dawn and dusk lines, and no 'LATI'; the reverse is blank. The back has a degree scale 90 to 0 to 90 to 0 to 90, divided to 5, subdivided to 1, numbered by 5. Within this is a zodiacal calendar with the date scale eccentric (the first point of Aries is at 13.5 March). The zodiacal signs are named, each has a scale 0 to 30 degrees, divided to 5, subdivided to 1, numbered by 5. The months are named, sometimes abbreviated, divided, as appropriate, to 5 days, subdivided to 1, numbered by 5. 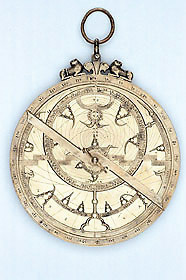 In the centre is a circular perpetual calendar for the date of Easter, and outside this a double shadow square, each of the four scales 0 to 12, divided to 2, subdivided to 1, numbered by 2, marked 'VMBRA VERSA', 'VMBRA RECTA', 'VMBRA VERSA'. The pin, with a decorated head, holds a counterchanged rule, a counterchanged alidade with shaped vanes, secured by a wedge. These all may be later replacements.